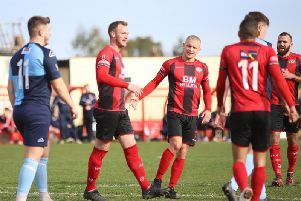 Kettering Town chairman David Mahoney wants to see the club’s fans packing into Latimer Park during the final push in the battle for the Evo-Stik League Premier Division Central title. On what could prove to be a defining day in the campaign, the Poppies seized the initiative as they returned to the summit for the first time since the middle of December after a dramatic 2-1 success at high-flying rivals Stourbridge last weekend. Trailing 1-0 with four minutes of normal time remaining, club legend Brett Solkhon equalised before Cambridge United loanee Tom Knowles won it with a stunning free-kick deep into stoppage-time. With 15 matches to go, the Poppies are now two points clear of Stourbridge with two games in hand and Marcus Law’s team return to Latimer Park to take on Needham Market this weekend. And, having been roared on a by a huge following in the West Midlands last Saturday, Mahoney now wants those fans and more to play a part on home soil. “Every Poppies fan who was at the game on Saturday would have seen the impact that their presence was having on the team,” the chairman said. “Even when we went behind our fans were out cheering the home support and the roof nearly came off when we equalised. “The fans really are the 12th man and you saw that in the final minutes. “I’m sure I wasn’t the only person in the ground who was a bit surprised to see Tom Knowles take it but he knew he had it in him. “I’ve seen various videos our fans have posted on social media and you can see what it meant to everyone, you can’t script those celebrations – pure passion. “We still have a journey to make and our season will be defined by the next 15 games, eight of which are at home. “I just hope every Poppies fan who came along to Latimer Park on New Year’s Day (for the derby win over AFC Rushden & Diamonds) and to Stourbridge on Saturday can make it this coming weekend when we play Needham Market. “We have 15 cup finals to play, the first of which is at home on Saturday and I hope that the fans can come out in force and show everyone what this club means to our community."